Women are buying and drinking more wine than ever, with 57% of total wine volume being purchased by women, according to Nielsen. The survey showed that overall more women are buying wine and drinking it more frequently — and at larger quantities than their male counterparts. With women dominating such a large market share of wine purchases, wine labels are wise to use data on women’s purchasing behaviours to their favour. 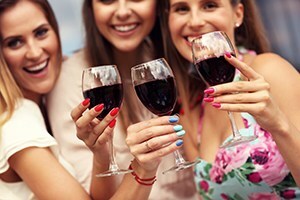 The average woman wine drinker hails from the millennial generation and is a professional. She cares about the environment and wants her wine brands to have the same values she does. A majority of 21 to 24-year-old female drinkers said that organic and sustainably produced products were important when they made their buying decision. The average woman drinker will do most of her drinking at home, surrounded by family, friends and food. She’s drinking wine at dinner. She doesn’t even mind drinking alone with a bowl of popcorn and Netflix. A woman’s preference to drink at home shows in the data trends — more than 80% of wine consumption is now happening off-premise. How a bottle looks matters to women. The average woman wine consumer will rate “traditional, classic, and sophisticated” labels more intriguing than other types of labels. She is more likely to purchase a bottle of wine she has never tried before based on the label, backing further research that packaging and labels are becoming more important than ever in a brand’s success. A woman knows in advance she will be purchasing wine 66% of the time. Word of mouth is key to choosing which wine she will purchase. A woman is more likely to base her purchase on a recommendation from friends, family, or an off- or on-premise staff, rather than seek out a wine they’ve read about. If able, brands should try to staff key locations to introduce the women shoppers to their brand, or train store employees to do so. Since women are the primary shopper in their household, how and where women shop for wine is becoming important to a brand’s success. How wine is displayed in convenience stores and grocery stores can help influence your ideal lady shopper. Suggest a food pairing with your wine or have a sign that shows wine can be consumed while watching sports. Since 2011 brands like Skinny Girl have been catering toward female drinkers. They offer low-calorie options in hopes of gaining brand loyalty and market share. The hit reality TV show “The Bachelor” dove into the wine market to cater to its target audience: millions of women sitting at home watching one man’s (or woman’s) quest for love. The franchise created a wine brand called The Final Rosé. The rosé wine is a play off the show’s mate-selecting technique: if a contestant receives a rose flower, she or he gets to stay on the show another week. These brands decided to lean into the fact that women are a huge market share and target them exclusively, and they’re doing it for a good reason. 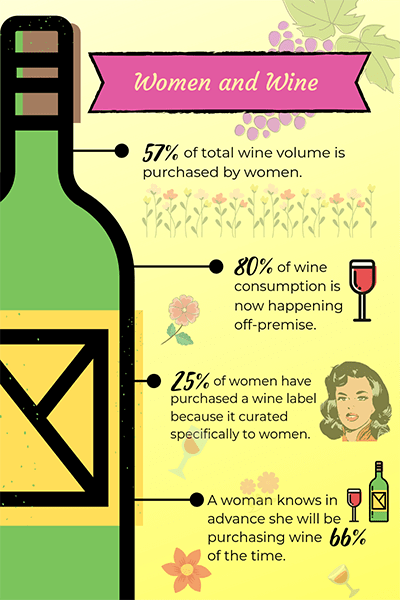 According to a WMC Female Wine Drinker Survey, 25% of women have purchased a wine label because it curated specifically to women. Fans, internet commenters and others showed the brand disdain in light of the #MeToo moment and some of media and politics’ most powerful men being accused of sexual misconduct. The brand ultimately pulled the label from shelves to show sensitivity toward women drinkers. Alter your label to be more attractive to shoppers. Train brand staff in stores to inform shoppers about the perks of your brand, or train store employees to do the same. Finally, if you’re able you can even consider a specific line of wines targeted directly toward women drinkers. Meredith Galante is a freelance writer based in New York City. She has been published in USA Today, amNewYork, Newsday, Square and more. She’s interviewed then-Mayor Cory Booker, Ryan Seacrest, and other New Jersey folks who made their community better. She’s covered breaking news, sports, features, and now frequently writes about small businesses.